The following article was first published on 6 January 2014 by several blogs which promote the Traditional Latin Mass. It is reproduced here for ease of reference. FEW YEARS AGO, I purchased the new (Novus Ordo) Roman Missal from one of the major publishers. I was shocked to observe that, while they did include traditional artwork, the pictures were kept separate from the Mass prayers, assuring that priests would never see it. 1 In some cases, the color pictures were even separated by blank, white pages. These post-Conciliar publishers had “hopped on the bandwagon” of Benedict’s Pontificate, opting for beauty instead of the ugly art so common since the Council. However, they failed to grasp the very purpose of that art: to edify the priest while saying Mass. 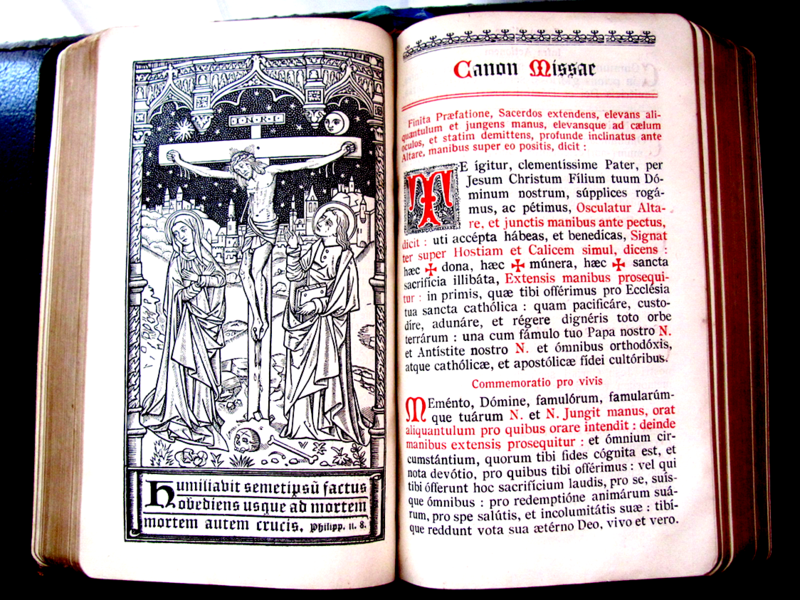 Contrariwise, the St. Edmund Campion Missal & Hymnal includes beautiful Catholic artwork for the traditional purpose: viz. the edification of the faithful. Since ours is a book for the congregation, printing the entire book in color was out of the question. 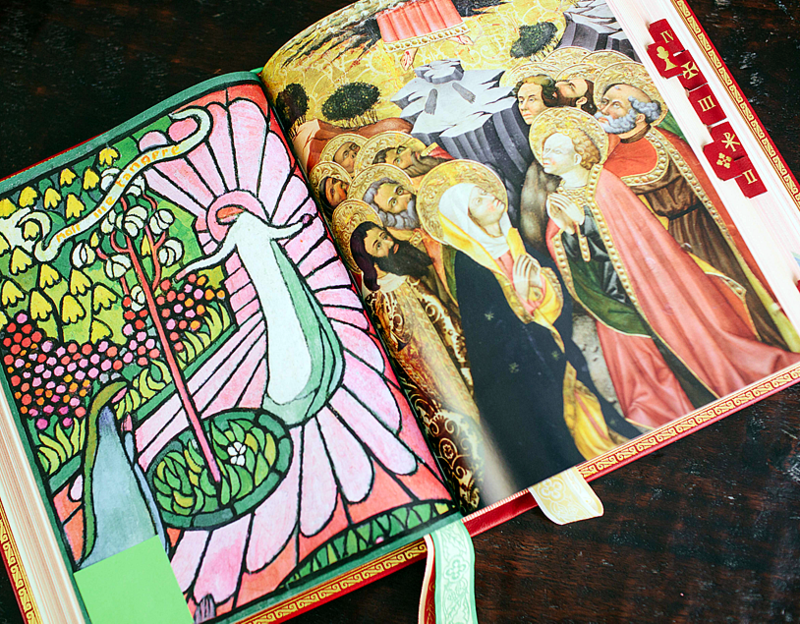 How, then, could we decorate the pages in a worthy way? We searched through hundreds of old books — Antiphonals, Breviaries, Graduals, etc. — and discovered how our Catholic ancestors solved the problem. These devout masters used black & white (the only colors available to them) to create utterly magnificent religious drawings. Incidentally, there’s a parallel here to music: composers and performers are usually at their best when limitations are placed upon them. Many artists find complete freedom overwhelming. Practically speaking, how might a Catholic be edified by artwork? 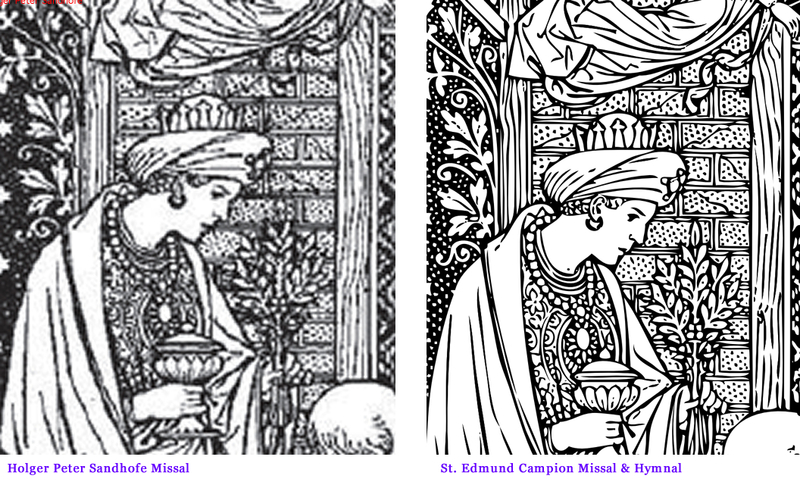 Obviously, it is not possible in this short article to explain all 100+ woodcuts in the Campion Missal, but perhaps a few examples will suffice. Let us consider Figure 1, one of our Good Friday images, placed toward the beginning of our Lord’s Passion. As we did throughout the entire book, we added English translations, whereas the original 19th-century woodcuts had Latin texts only. Perhaps some may be puzzled when they read, “Go up, thou bald head.” What does this have to do with the soldiers mocking our Lord? The Biblical text (IV Kings 2:23) relates an incident where young boys mocked Elisha, the Lord’s prophet, and were subsequently eaten by bears. The lesson here is simple: never mock God. Never mock that which is holy. Once, as a young boy, I jokingly used a cleric’s plastic white collar as a whip. The seminarian looked at me with horror and said, “How dare you? That object is blessed.” The lesson stuck with me in a powerful way through the years. In the picture’s other reference, a parallel is drawn between Solomon’s crown (Canticles 3:11) and our Lord being crowned with thorns. I can only imagine the beautiful way a preacher like Fulton J. Sheen would develop this theme. Let us consider Figure 2, which we used as a Header for Good Friday. Many traditional Missals use this image or a variation of it, as illustrated by this example. Certain obvious features strike one immediately, like the famous skull under the Cross (representing an Eastern tradition that Christ died in the same spot as Adam). The Sun and Moon are found in thousands of Crucifixion depictions, and likewise seem to have originated in the East, e.g. Syria, around the sixth century. They refer to Mark 15:33 — “And the sun was darkened” — also described by the other synoptics (cf. Mt 27/45 and Lk 23/44). On the other hand, there are more subtle things in this picture: consider the background castle. We know “the place where Jesus was crucified was close to the city” (Jn 19:20), and it is perhaps only natural that crucifixions be done outside the city. Yet, the artist’s depiction is no first-century city: it’s more modern. This might remind us that “busy city people” are only concerned with things of the world: pleasures, success, power, fame, and so forth. Worldly people don’t want to deal with “the uneducated poor” or “dirty criminals.” Least of all do they wish to be reminded of our Lord’s crucifixion. As a matter of fact, many people who constantly and publicly proclaim their love for the poor live in gated communities and frequent only the most privileged gatherings so they won’t ever have to see the poor. Gazing upon this crucifixion scene, perhaps we should ask God to give us graces to follow the example of the saints, shunning worldly desires. Considering Figure 3, which we used for Christmas Midnight Mass, we are reminded that 19th-century Catholics took the Word of God seriously and their knowledge of Scripture was often quite profound. Indeed, sometimes these images contained more Scripture references than we could accommodate. For instance, the original of Figure 3 referred to six passages from the Old Testament, sometimes by means of a single word only (e.g. “Parvulus”). Because we couldn’t fit all of them in a satisfactory way, we divided two amongst the other Christmastide Masses. Notice in particular the powerful reference to Moses approaching the burning bush, removing his shoes. Again, I can only imagine the beautiful way a great preacher like Msgr. Ronald Knox would relate this event to our Lord’s birth in a humble stable, such a surprising “terra sancta” (Ex 3:5), for behold, a greater than Moses is here (cf. Mt 12:41-42). In January of 2013 we began releasing these images (full resolution) each week on the Corpus Christi Watershed blog. Currently, more than fifty can be downloaded, and we still have hundreds to release. All images had to be scanned at high quality and painstakingly digitally enhanced. Viewing this comparison chart somewhat illustrates why this was necessary. We were happy to exert all this effort because beauty often brings men closer to God in a mysterious way. What do I mean? Writing this article, I remembered something out of the blue. When I was very young, I used to search every library I could for pictures of ancient cathedrals. The splendor of these structures (which still has the same effect all these years later!) spurred me on to learn more about the Church, the saints, and Christ. I’m sure many readers have had a similar experiences. 1 Moreover, some of the choices made by the post-conciliar editors can only be described as a detestable hodgepodge.